America is having a renewed—but frankly disappointing—dialogue on the subject of immigration in 2015. Our great country doesn’t exactly have a pristine record when it comes to welcoming émigrés, of course, and so the undercurrent of angry paranoia voiced in that dialogue is neither new, nor especially surprising. It is, however, counterintuitive: The U.S. is an immigrant nation, built by foreigners who left their homes to land upon her shores and share in the wealth of opportunity. That’s the myth of America, anyways—but held under harsh light, it starts to wither. Maybe all we need is a reminder of how much richer we are for our history of receiving outsiders and honoring them as we would honor our neighbors. And if so, let that reminder be John Crowley’s Brooklyn. November has presented film and television audiences with a trio of narratives that each relate back to immigrant experiences. In addition to Crowley’s film, we have Jonas Carpignano’s Mediterranea and Aziz Ansari’s excellent Netflix series, Master of None. If you decide to make a day of watching both movies and binging on Ansari’s show, you’ll take away different lessons from each about why people make exodus to the United States in the first place—for more opportunity, for a better life, for love of their children, for security, for safety—and what they risk by making that journey. In Brooklyn, the “why” and the “what” pivot on the excitement of arriving in a new place: It’s about the combined thrill and anguish of uprooting one’s existence. The film is based on the book of the same name by Colm Toíbín, an Irish writer whose prose suggests a man who’s missing an appointment. Crowley, in contrast, prefers to take his time, but by using both Toíbín’s novel and Nick Hornby’s screenplay as his blueprint, he can’t help but be guided by purpose. 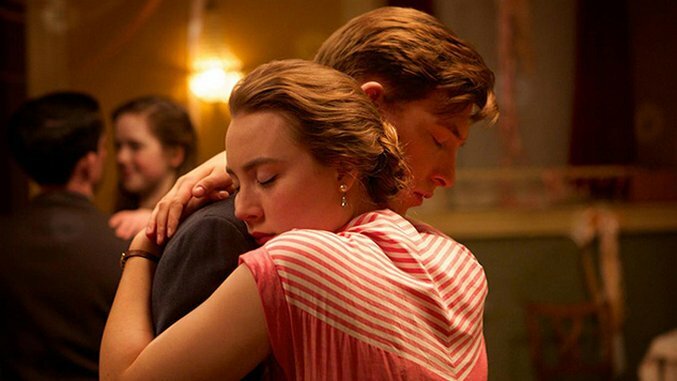 Brooklyn lingers even as it wastes no time in getting its protagonist, Eilis (Saoirse Ronan), to where she needs to be. Eilis is from a small town in Ireland, where work is either scarce or miserable. We meet her working in a general store run by Mrs. Kelly (Brid Brennan), a wretched harridan who admonishes her employees and customers in equal measure, often with off-putting glee. The good news for Eilis, though, is that her older sister, Rose (Fiona Glascott), has made arrangements for Eilis to go abroad and relocate to Brooklyn. The bad news is that it’s the 1950s, so the oceanic process of getting from point A to point B is horrible. Worse than that, nobody has smart phones to keep in daily contact with one another. Brooklyn wraps itself both around the wonders of exploring Eilis’s new world and the separation anxiety she feels for her old. Everything that’s so commonplace to her fellow Americans is completely alien to her, and she has nobody to turn to apart from her boarding housemates and Father Flood (Jim Broadbent), a priest she knows from back home. But Eilis’s loneliness dissolves slowly over time. She sheds her green coat, a clothing item meant to make her stand out in a crowd (and also supply metaphor), and acclimates to the city. Best of all, she finds herself a beau after a chance meeting with Tony (Emory Cohen), a young Italian lad who, as any young Italian lad would, falls head over heels for her in what feels like the blink of an eye. It happens so fast that you might think you missed a reel, but that’s the stuff of which Brooklyn’s made: the peaks of honest love and the valleys of heartbreak. The film is a refined and well-mannered whirlwind, but as Eilis grows accustomed to her surroundings, Ireland issues its siren call to bring her back to its emerald shores, where she is courted by local bachelor Jim (Domhnall Gleeson) and is ultimately forced to choose between Brooklyn and home. Crowley deserves much praise for the deliberate classicism of his aesthetic. His plotting, such as it is, is seamless, and his style lends the brevity of Toíbín’s novel enough creative space to stretch out before our eyes. The Brooklyn of today might be overrun by hipsters with their artisanal obsessions, but Crowley’s romanticized vision of the borough renders it a spotless bustle. The film is a snapshot of life’s passing parade from decades past. Still, the sterling visual qualities Crowley brings to Brooklyn pale next to its casting. Ronan, perhaps, is the most obvious choice to play Eilis, but that’s because she’s perfect. Is she the best actress of her generation? Brooklyn, which barely lets a single frame go by without her, seems crafted whole cloth from a “yes” reply. Ronan gives Eilis a strong center, and even in Eilis’ darkest moments she retains her backbone, but it’s Ronan’s gift for inviting empathy that makes her so extraordinary. When Eilis comes to accept Tony’s profession of love for her, we see that Irish stiff upper lip give way to naked vulnerability. Ronan pulls off a delicate emotional balancing act in these moments: Her sadness and grief never fully disappear, she just marries them to her newfound happiness. Watching her unite both halves of her performance is a pure joy (though Cohen’s aw-shucks affability is a pleasure, too). Like Master of None, Brooklyn sees the good and the bad, the light and the dark, in immigrant experiences. Crowley doesn’t whet Brooklyn to give it an edge. It’s soft and gentle, peaceful where Mediterranea is tumultuous, tasteful where Master of None is delightfully crass. But beneath the surface of the film’s polished poise there is more forceful subtext about the rich, myriad threads of America’s cultural tapestry. Eilis’s tale is just one of many like it, each as integral to its foundation as the last. Brooklyn is a tender romance and a gorgeous picture to behold, but more than that, it’s a document of struggle—and a celebration of American life. Boston-based critic Andy Crump has been writing online about film since 2009, and has contributed to Paste Magazine since 2013. He also writes for Screen Rant, Movie Mezzanine and Birth.Movies.Death. You can follow him on Twitter. He is composed of roughly 65% craft beer.